Silver Whisper restaurants are a treat! There are four Silver Whisper restaurants including Italian and French specialty venues. Every meal is an epicurean delight. The chefs use top quality ingredients and create dishes that are full of flavour. The Restaurant is the main Silver Whisper dining venue. In fact it is a Silversea classic that sparkles with silverware and crystal glasses. The decor in the Silver Whisper Restaurant was refreshed in 2016. The menu in The Restaurant is always varied. In fact there’s something to suit every taste. It offers contemporary, international cuisine as well as regional specialities. Diners can mix and match from a range of daily specials as well as classic Silversea dishes that are always available. We especially enjoyed the Tuna Carpaccio with Lettuce & Cherry Tomato Salad and Basil Olive Oil, as well as the New Zealand Roast Lamb with Oregano and Provence Herb Glaze. The Restaurant is on deck 4. It has open seating, so there are no set dining times or tables. You can dine when, where and with whom you please. Also, you do not need to make reservations. It is one of the great Silver Whisper restaurants. La Terrazza is a signature Silver Whisper dining experience. Moreover, it reflects Silversea’s Italian heritage. Diners can enjoy buffalo mozzarella from Naples, as well as organic balsamic vinegar and olive oil from Umbria. There is also delicious air-dried prosciutto from Parma on the menu too. At breakfast and lunch La Terrazza offers a buffet selection. However, at night the venue is different. It becomes a traditional à la carte Italian restaurant. This is one of the standout Silver Whisper restaurants. 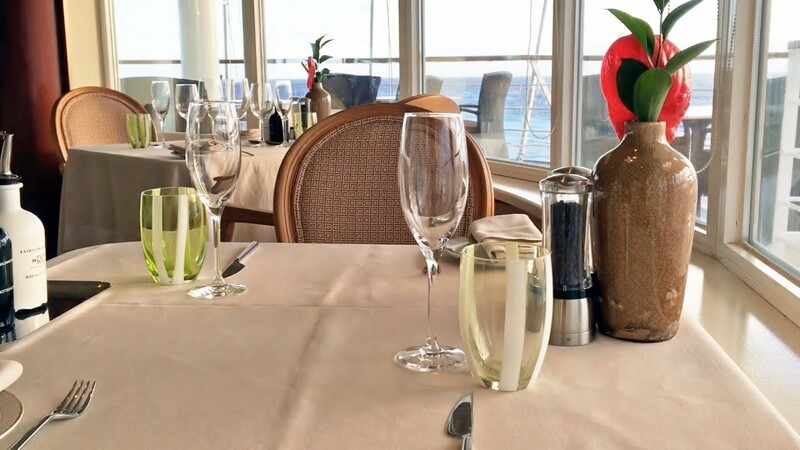 The menu reflects the seasons as well as the regions that the cruise ship sails through. It also embraces the slow-food movement. The menu is a four course Italian affair with starters, followed by pasta, then meat and fish main courses. Delightful desserts end each meal. Le Trenette al Pesto in La Terrazza. We rate the pasta, which is made daily and prepared to perfection, as exceptional. The pasta dishes change regualrly, however during our review voyage we enjoyed the Trenette al Pesto – pasta with Basil, Garlic Pine Nuts and 26-month aged Parmesan. La Terrazza is on deck 7 at the back of Silver Whisper. Weather permitting guests can dine al fresco on the terrance where the stunning views equally match the excellent cuisine. There is no additional charge for eating at La Terrazza. However, you will need to make a reservation. It is one of the most popular Silver Whisper restaurants. Le Dame is a new Silver Whisper restaurant. Or perhaps more accurately put, it is an evolution of the much-loved Le Champange. Like Le Champagne, the new Le Dame restaurant is a partnership with Relais & Châteaux. So the menu retains a classic French flair with the finest of ingredients. Indeed, the menu in Le Dame is outstanding. Guests can savour farm-raised Caviar, as well as Chilean Sea Bass with Lemon Butter Sauce and White Asparagus. We especially liked the Lobster Tail with Truffled Leeks in a Green Pea Jus. The Filet de Boeuf is excellent too. Lobster Tail with Truffled Leeks in a Green Pea Jus as served in Le Dame. Fine wines and Champagne are free of charge. Indeed, they are a cut above the already good house wines available elsewhere on the ship. Premium bottles can be purchased for an additional charge. The Le Dame restaurant sommelière knows the wines well, so we recommend asking for assistance to match wines to your meal. Le Dame is located in the place once occupied by Le Champagne. Indeed, when we sailed the sign on the door still hadn’t been changed (some guests were confused). The restaurant is open for dinner only. There is a cover charge of US$60 per person. Also, you will need to make a reservation. 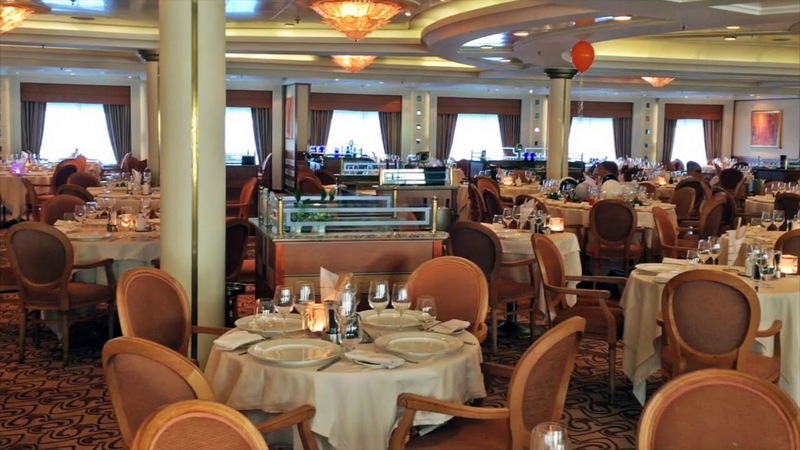 We rate it as the best of the Silver Whisper restaurants. The Grill is the most casual of the Silver Whisper restaurants. It is on the pool deck with great ocean views as well as soft sea breezes. Grilled fish is on the menu every day at The Grill on Silver Whisper. During the day The Grill offers a buffet selection as well as classic burgers, salads and grilled fish. However, at night guests can cook their own food directly at the table on hot lava stones heated to 400ºC / 750ºF. Prime cuts of veal, lamb, steak and seafood are available, as well as tofu for those who’d prefer a vegetarian option. Reservations are required for dinner, however there is no additional charge. The Grill dress code is casual every evening. Each of the Silver Whisper restaurants serves wonderful meals. They also share a unique Silversea atmosphere. The four Silver Whisper dining venues offer lots of variety. All things considered, our favourite Silver Whisper restaurant was Le Dame. 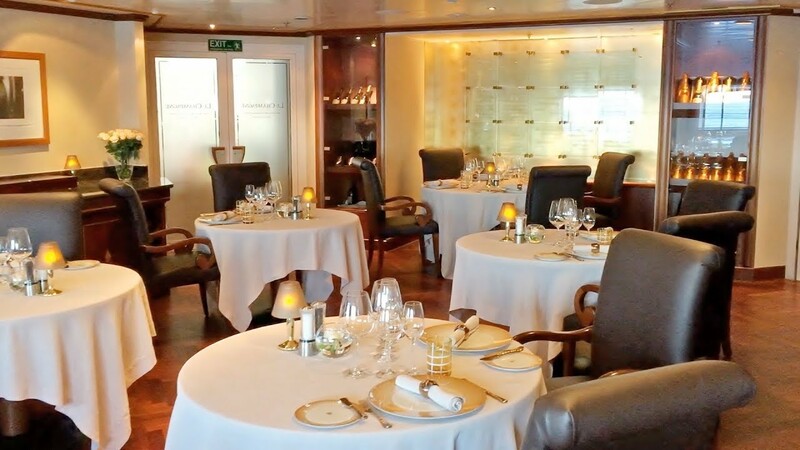 For more information about the Silver Whisper restaurants visit the Silversea website.